This is true story from the assisted living facility where I work. The names have been changed to protect the privacy of the residents. Of all the stories I could tell you, this is one of my favorites. I have worked in nursing homes and assisted living facilities for many years. I have seen many things and gotten to know many people. Many things have touched my heart but this one is really special. Richard lived with his wife, in our assisted living facility for 10 years. They had their own apartment and were a high functioning couple. A few months ago, the wife passed away suddenly. We were all quite shocked, but none of us were more upset by her sudden death, than Richard was. His mental state began to quickly decline, after his wife’s death. He loved her very much and he relied on her to keep his schedule straight. She made sure he got dressed, came down for meals on time and that he took his medications. Richard’s wife was the key to his ability to stay clear and oriented. After she passed away, Richard became very disoriented. He looked for her every day, and every day we had to tell him that she had died. He just could not remember. He became confused about meal times and he did not know how to organize his day. He wandered around the floors of the building and we would have to find him to remind him it was time to eat. Molly is awesome and the nicest, most considerate person you will ever meet. She ended up living in our Alzheimer’s Unit, after her family was afraid she would wander away from the house and get lost. She has very mild dementia and most of the time she is very functional. She helps us fold laundry and she even sits with other residents when they are sad, in order to comfort them. But every day around 4pm, Molly used to tell us she had to leave. She would suddenly believe that she was 16 and her father, who had long since passed away. was waiting for her. She would insist that she better not be late or her father would be angry. It is not uncommon with dementia that the person will believe they are decades younger than they are. They still believe that their parents are alive and well, even though they passed away 30 years ago. So anyway, Molly would argue, cry and become very afraid of her father being angry with her, for being late. Every day, Molly went through this mental / emotional anguish. She would cry and be so upset every single day from 4 pm until about 6 pm. Richard got worse and the nurses found him running through the halls without his walker. He fell and became injured. Richard was no longer safe to be out in the apartment areas. He now had to be moved to the Alzheimer’s / dementia unit. Richard was at dinner the first night and he was fine. He came out to the living room area to watch a movie with us. He ended up sitting next to Molly. Molly was so happy when she saw Richard. It was mostly women in the unit at that time and a man was something special! Molly sat with him and talked with him about all kinds of things. From then on they say together at dinner every night and also during movie times. It was amazing ! Molly stopped getting upset every day. . She completely forgot about her father, and she stopped trying to run away every day. She was happy being in our unit with Richard. She began to look after him, kind of like his wife used to. 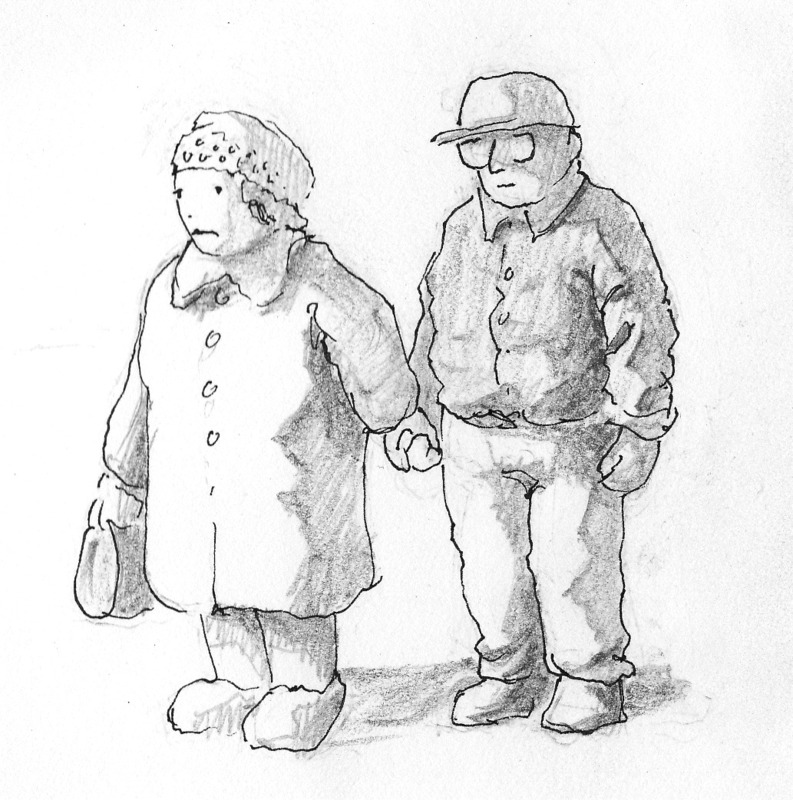 She reminded him that he needed to take his walker with him, when he walked somewhere. She reminded him when it was time for dinner and walked with him to the dining room. If he needed anything, she would ask one of us to help him. Richard became happier and eventually stopped looking for his wife. He was happy to have Molly as a friend. He willingly accepted her kindness and let her look after him, in the best way she knew how. So, Molly is no longer trying to leave. Richard is no longer looking every day for his wife, and having to be re-traumatized day after day with the news that she died. Last week I looked over to see Richard and Molly sitting on the sofa. Molly had her head resting peacefully on Richard’s shoulder and they looked very natural together. They have found new kindness in their lives, and it has made a huge difference to each of them. This is compassion, love and kindness at it’s best. Now you know why this is and will always be, one of my very favorite stories. Of all the things I have seen over the years, this was truly a real miracle. Richard and Molly are probably watching television together as we speak. Think about it, one day we will be that old too. Life is a miracle. If we just let it happen, great things unfold. Yes it is true! There is always room for love and miracles in our lives, at any age ! I have to thank you!!! This was an amazing story! I felt as though I was there watching it all as it played out. Thanks for sharing. I am very happy to have been able to share this ! I am glad it uplifted you ! It was beautiful! Thanks, Annie! Just lovely. Wonderful that they found each other. Yes it was truly a miracle for both of them. I just saw the picture that kindness blog put for this post. The man looks just like Richard ! He actually wears a hat all the time, just like that and he has the same glasses! Molly is similar but more fashionable. She used to be a model in New York ans she has retained her sense of beauty, style and self esteem in her appearance, even in the early to mid stages of dementia. That too is a blessing and a miracle! Thank you so much for sharing this story with us . Kindness and compassion at it’s very best . God Bless . This brought a tear to my eye. Well done for noticing all of this, and thank you for sharing such a powerful experience. You are right about “noticing” this. There are lots of people who work at nursing homes and they do not really “notice” the stories that unfold. I think it is the same everywhere. There are beautiful things in the midst of the trauma and sadness. If we look around us, we can enjoy life better, by seeing the beauty. Thank you for reading and taking the time to comment. I am glad this story meant so much to people. I think that when we find out that there is still possibility for love in old age, it gives us hope. There is still hope for happiness, even after the death of a spouse. There are other couples that have met in nursing home / assisted living and they give each other companionship and friendship. They hold hands and sit together at dinner. Thank you so much ! I am glad you found me on the Kindness Blog. This is such a wonderful blog. I am honored to be able to post here ! When God closes one door, He opens another! 🙂 Beautiful story! Yes, that is most certainly true ! Even in our darkest, most hopeless moments, God is watching and planning to open a new door for us! You are very welcome! It was fun to share it with people who would truly appreciate it! My husband has Parkinson’s, my mother is moving into dementia…but life hasn’t changed…yet. This snapshot of “possibilities” is comforting…very, very comforting. Parkinson’s and dementia are both very hard diseases for the people and for the families to deal with. It is sad to watch them getting worse. But both of these diseases are very slow and progressive. The best thing is to enjoy the moments. It is the moments in life that have value. Mindfulness about watching and seeing the beauty in certain special moments will help you to get through these hard times. I’m grateful you took the time to tell me this. I am glad if it helped a little bit. I was thinking of writing more posts about dealing with a loved one with dementia.There are a lot of people who need to understand what is going to happen and what their role should be. Everyone is different. You can only do what you can do. The more family and friends you have as a support system the better. Sometimes you will just need a little break and need someone to take over for you. There is even such a thing as RESPITE care, and most insurance companies cover it. respite care is a time frame that care will be provided for a family member with a disease, in order for the primary caregiver to get a mental break. It has been studied that even a very loving family member will burn out from performing day to day care for a long time. I wish you well and I know you will remain strong. Just remember that even though it is the other family members who are sick, you are also a person and you are equally affected by the situation. Reach out for help if you need to. Know your limitations. Even people who visit their spouse or their mother in the nursing home every day can get burned out.They need a break. I know one family that has friends that take a turn once in a while. They do in every day to visit the mom, so that the daughters can go on vacation or just take a break at home. Even now I have experienced much of what you’ve said. Thank you – from the heart – for this comment. Terrific story. My mom has Alzheimer’s and lives at the Actors Home in NJ. I know how difficult it can be. It is very hard to have a parent with Alzheimer’s disease. I feel for you. I see the families deal with it all the time, and it is never easy for them. No matter what stage of Alzheimer’s they are in, you can usually create special moments with them, Once they are at a certain stage of dementia, they live by the moment. They do not remember what they had for lunch but they do understand that you are holding their hand right now. Showing kindness will bring reward to you. Treasure the special moments in your heart. You will be able to keep them forever. The development of new friendships in LTC settings can be very comforting, as was the case with Molly and Richard. Sometimes these relationships blossom while still married to someone else. It takes extreme kindness and understanding for the cognizant spouse to allow that comfort to exist for their memory impaired loved one. It’s not a breaking of ones wedding vows, rather, it’s a celebration of still having the ability to give and receive love. Yes I have seen that and your perspective is very insightful and open minded. It is easy for people to judge other, when they have never been in the situation themselves. There are times when someone needs the comfort of another human. Thank you for sharing this story on your blog. Very lovely, he says through tears thinking of his mom. Thank you. Sorry about your sadness about your mom. These things are hard. It is nice to see some of the blessings in between the hardship. It is all we can do. Such a wonderful story, it is as though both Molly and Richard needed something which they received from each other to replace what was missing within them. Yes, that is exactly right. They met the need for companionship for each other. They have both been happier since they met. Thank you for taking the time to comment. Wonderful story. Thank you for sharing it. Glad that Richard and Molly found each other, just loved their story.